The 9 “arts” are simply observable practices in the life of Jesus that make spiritual conversations flow easily with spiritual seekers. When Christians grow stronger in these skills, evangelism and discipleship are the natural outcomes. Being aware of those around you and paying close attention to what God might be doing in their lives. Asking God to work in the lives of people you meet and to show you what he wants you to do to bless them. Demonstrating genuine care, interest, and empathy as you interact with others without editorializing or offering unsolicited opinions. Seeking to understand more than to be understood and letting genuine curiosity take the lead to open up conversations. Letting your relationship with God overflow to people around you so that you see them with his eyes. Valuing the presence of people and helping them feel that they belong. Leading a discussion in a group setting so that everyone makes discoveries and feels honored, respected, and heard. Gathering people to work for a common cause and helping them know God and each other better through the shared experience. Relating your faith story, learning others’ stories, and expressing God’s story of forgiveness through Jesus in a way that is respectful and meaningful. Give the Gospels a fresh look and notice how intentional Jesus was with individuals he encountered. In fact, he developed a reputation for spending time with outsiders. Preaching and proclamation were significant in his ministry, yet he spent the vast majority of his time on the road with twelve men who were slowly coming to understand who Jesus was. They were taught, but they also caught how Jesus made disciples. They learned from him how to engage spiritual seekers and walk with them on the discipleship journey. So can Christians in the 21st century. So can churches. With the 9 Arts, your church can grow in evangelism and discipleship at the same time. Read The 9 Arts of Spiritual Conversations, by Mary Schaller and John Crilly, to understand what the 9 Arts are all about. 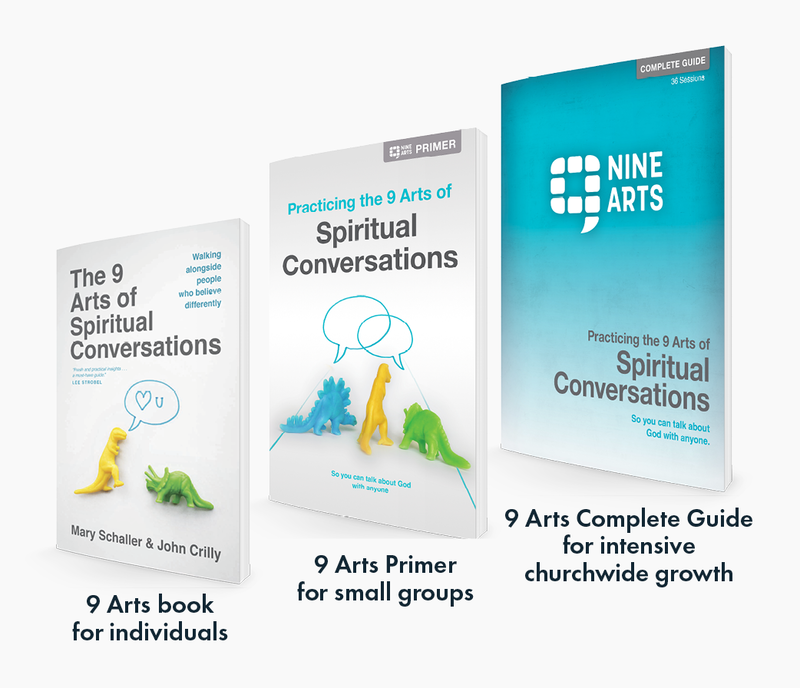 Then go through the 9 Arts Primer in your small groups or Sunday school classes to practice the 9 Arts. It has 9 sessions (1 for each art). The 9 Arts Complete Guide has 36 sessions (4 for each art, including everything in the primer). Use it for intensive growth in these practices. Choose the handy print version or purchase the digital church license for the greatest flexibility in your unique church schedule. Check out the full line of 9 Arts resources available from Q Place. View and download your free 9 Arts Sample. As a pastor, you can cast vision for engaging in these practices that build relationships as Jesus did by preaching a 9 Arts Sermon Series. Scroll down and fill out the form below to receive your free Sermon Outlines & Ideas. Encouraging Christians and churches to engage in the 9 Arts is an important part of the ministry of Q Place. We would love to see many more Christians walking the way of Jesus—practicing all 9 Arts—and inviting people around them into small groups where they can find God as revealed in the Bible.